Futurekids offers a variety of comprehensive technology professional development courses designed to train educators in the basic fundamentals of computer literacy, the application of technology in the workplace, curriculum integration, and classroom management with technology. Our technology professional development courses address core technology areas, from operating systems, Internet, multimedia and graphics, to word processing, spreadsheets, desktop publishing, database, and applied technology. 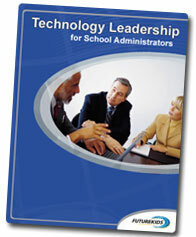 Technology Leadership for Administrators offers a customized handbook for both School Administrators and Technology Coordinators. Handbook and courses are customized towards customer needs. Technology Leadership for Administrators will help education leaders obtain practical guidance for assessment, envision how they can prepare schools for the future, and implement a 21st century education.